The phone rang. It was Pike. "Yo. Wanna get dinner?" Sure. How about that new place on 70th? "Sounds good. What's it called?" I think it's called The Grill. At least that's what they have glowing over the sidewalk. "Oof. Least Googleable name ever. How about 7?" When I arrived, Pike had already found a table, though that wasn't hard since he was one of the only people there. It was a Tuesday and the temperature was frigid. Every restaurant, even the normally standing-room-only Cabana next door was relatively deserted, so I wasn't terribly surprised that The Grill was as quiet as a tomb. Warmer weather will decide if this is a trend. When the weather warms up and the sidewalk brunch crowds come out in force, it will be interesting to see what The Grill looks like on a Sunday afternoon. 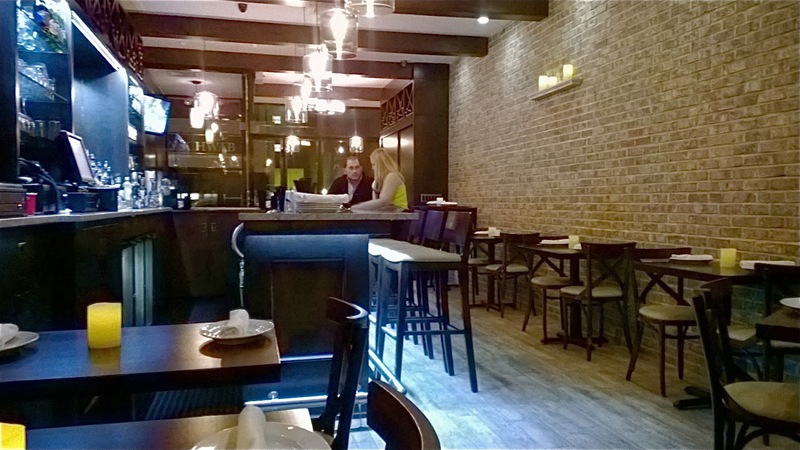 The Grill is Greek/Mediterranean, and replaces Liang's (fka Peking Duck). It's brand new and looks it. The owners did a total gut job on the former restaurant. 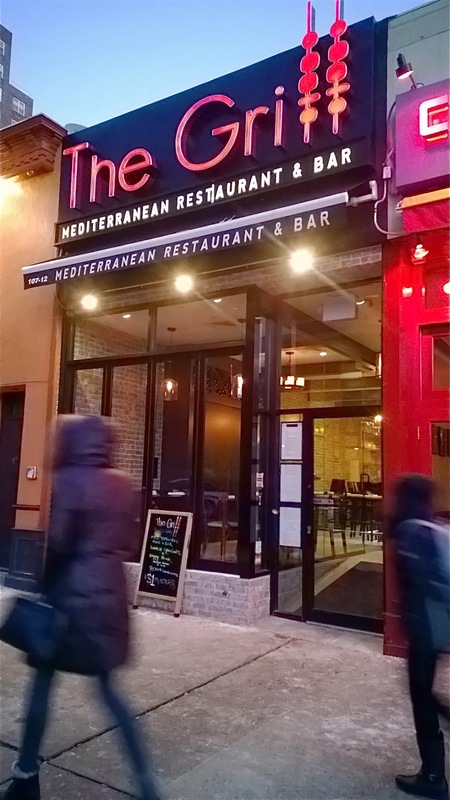 From a cost perspective, The Grill is priced near the neighborhood's top alongside its biggest competitor, Agora Taverna, the Greek seafood spot a block away, with average entrees between $25-$30. Is this too expensive? Well... yes and no. No, because the food was impressively good. You're not going to leave feeling disappointed, believe me. But yes because, unlike many other cuisines, Greek restaurants are notorious for being utterly devoid of presentation (sticking a lemon or parsley sprig on the side of a plate doesn't count) and The Grill wasn't breaking the mold. Instead of just sorta dumping the food on a plate, I'm of the opinion that if the dish arrived looking more interesting, I'd be less inclined to wince at the bill. When Pike sees a raw bar option, he gets it. It's like me and escargot. If it's on the menu, it takes real power to pass on it. 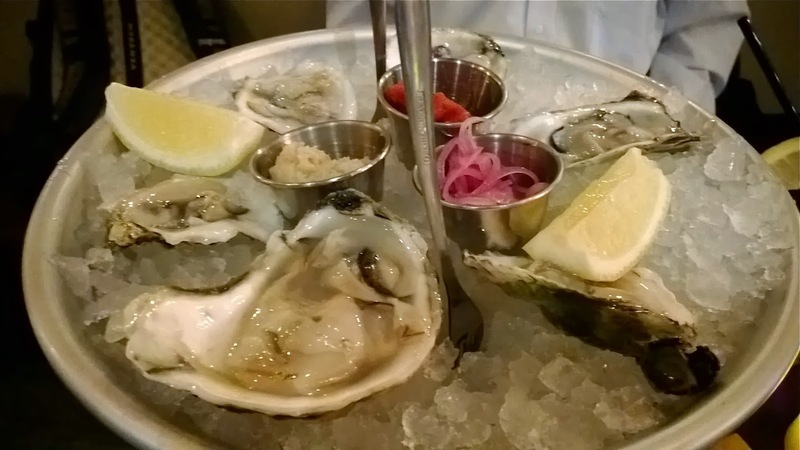 So, naturally, we split a half dozen oysters. $12 and they were huge (not that such things matter to connoisseurs, but that ain't me). These were big. And they were good. The cocktail sauce... not so much. But we enjoyed the oysters. Pike also wanted me to mention that the bread was good. So there we go. 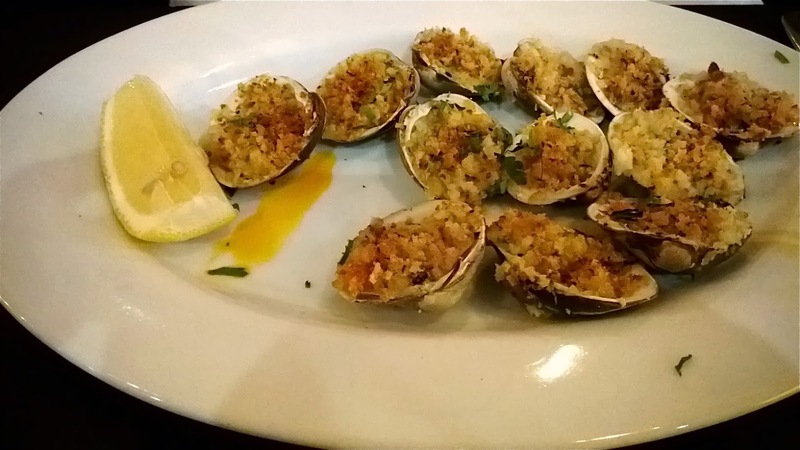 Good oysters, good bread. This was then followed by Pike with the Baked Clams Oreganato and by me with the Octopus. The clams, baked with herbs and olive oil was praised by us both, but we also both felt that the octopus, which was grilled just enough to give it a hint of charring and was served with grilled onion, was the real winner. It wasn't too salty, it was firm without being rubbery, and, when you cut up the jalapeno it came with and toss it into the mix, it adds a nice hearty amount of burn. Uhhh, a quick diversion. I've said this before and I'll say it again. I hate it when I get a choice of sides. I don't want the choice of a side. I want the chef to pick the one that he thinks best goes with the dish. Because, presumably, he's a professional who went through training so he (or she) could become the head honcho of the kitchen and, presumably, he created the meal that has been set before me and didn't get it from the side of a can of Campbell's Cream of Mushroom Soup. At that point, should I have some dietary restriction where my religion forbids mini arugula salads, or I'm allergic to sauteed spinach, or maybe if I just have some innate pressing need to have french fries and rice served to me with every meal because when I look in the mirror I go "nah, not fat enough", then I'll tell the waitress that my thighs miss each other and can I please have some of their finest deep fried starch, instead. You know who gives you a choice of side? Sizzler and The Ground Round. That's the the image that comes to mind when I see it on a menu. Every time. Every. Single. Time. "Oh, am I at Sizzler? I should ask for the all-you-can-eat bucket o' steak." Speaking of steak, steakhouses, soul food spots, and barbecue joints get a pass. Sorry, them's the rules. Okay. Rant done. Where was I? Oh yeah. 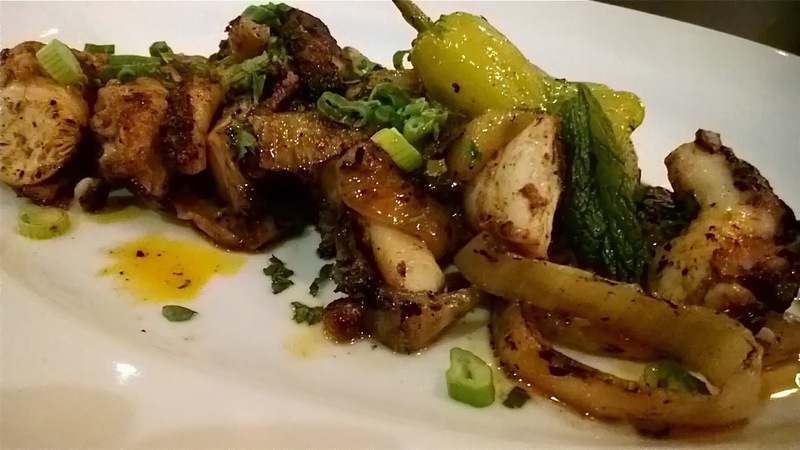 The Chicken Tabaka, butterflied and grilled with spices and olive oil and served under an au jus. It was delicious. 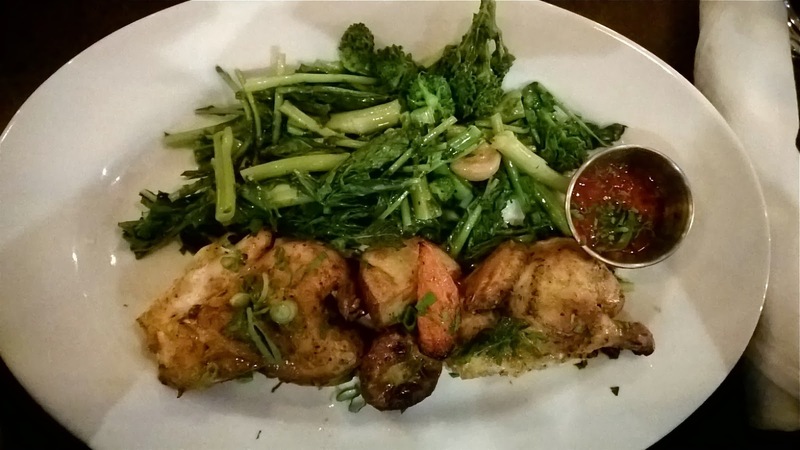 It was worth the $22 and I ordered a side of the garlic sauteed broccoli rabe to go with it which was also very good. The chef should really pair these two. Pike ordered the Seafood Extravaganza (an unfortunately Sizzlery name) because, as he said "this way I get to try everything." It was grilled on and arrived on an impressive giant skewer that looked like something you could defend a castle with but, alas, the waitress took the seafood from its home on the sword. See, now a sword would be a fun and memorable way to plate the food. Anyway, the extravaganza included a jumbo shrimp, a large scallop, a big piece of sea bass, and two big pieces of salmon. The sea bass was fantastic, the scallop was okay but too salty. Pike also liked the salmon and the shrimp, but I didn't grab a bite of those two. There is no photo because the image was not interesting enough to use up any of my Blogger photo credits on. See? Plating is important at this price point. We decided against dessert because... well, no reason really. Pike and I just always get dessert at Martha's. So we went there along with everyone else in the zip code and grabbed the last table. Apparently, it wasn't too cold out for cake. A half dozen oysters, two appetizers, two entrees, and two sodas, plus tax and tip totaled $120. I also want to give a hearty shoutout and THANK YOU to our waitress who ran out into the cold without a coat on to return my credit card to me, which I absent-mindedly left at the table. In conclusion, all of my petty criticism aside, everyone should go to The Grill and leave her a big tip.